What if commodities already made their secular peak in 2011, as potentially shown by the equally weighted commodities index? It would mean a solar peak occurred at the turn of 2011 into 2012, and that would make a 2011 secular commodities peak within a historically normal close time range. The Dow-gold ratio has not hit the extreme of the last secular commodities peak (circa 1980), but could be considered to have reached low enough for a secular conclusion: out of the green band below. The low to date was reached in 2011, which fits the scenario I am outlining. If commodities already made their secular peak back in 2011, then we should be in a new secular stocks bull. So what if the final cyclical bear (with the secular bear) and secular p/e low valuations already occurred and is not ahead? A couple of charts from October last year showing how that could be so. What if the secular bear pentagon for the Dax needs redrawing as per the red line – that the market broke out in 2011 then retested the nose level of the pentagon later that year (in a final cyclical bear at that time), reaching a final single digit p/e valuation of 9? Clearly p/es of 8 and 9 fit the remit for a secular bear single digit p/e cheapness conclusion. But what about the SP500? It only reached a p/e of 13 at that point. Well, at the end of the last secular stocks bear (circa 1980), although multiple country stock indices reached single digit p/es, not all did. The Nikkei bottomed at a p/e of 20. Furthermore, if we widen to consider CAPE valuations, Greece hit the lowest ever seen of around 2 last year, i.e. a secular cheapness extreme never before reached (Thailand held the record with 3 during the Asian financial crisis). If we consider price to book valuations, Japan reached below 1 and Russia also. So again, if we are looking for evidence that the secular bear washed out equities sufficiently, then we can make a case. If the sharp falls in equities in 2011 represented the last cyclical bear of the secular stocks bear, then there should be some telltale pointers. For it to be a cyclical bear, it should take at least 20% off prices. For multiple indices this was so, with both the Dax and the Hang Seng dropping 30%. That cyclical bear should precede a recession, and such a recession occurred in Europe and Japan, amongst others, in 2012 (in a ‘double dip’). That cyclical stocks bear should have begun from a situation of excessive rising rates and inflation. We saw both sharply rising European yields in 2011 and a rise in inflation because of commodity prices. If this alternative scenario is correct, then the implications would be significant. It would mean that the point at which to load up on equities already occurred in late 2011, and that what we are seeing currently is new secular bull momentum. It would mean that commodities, as a whole, should now make a lower high in a last chance to sell out of them before they are mired in a secular bear. It would imply that the current pick up in global growth is the real deal, and that growth will now sustain going forward, with central banks unwinding their support. So what are the problems with this alternative scenario? 1. The consensus between Nasa, Sibet and SIDC (CM) is for a solar peak ahead later in 2013, so I rate a peak in the past as lower probability. 2. Although silver achieved the parabolic and the collapse in 2011, gold appears to have coiled near the highs in a more measured fashion which does not look like a secular top. 3. 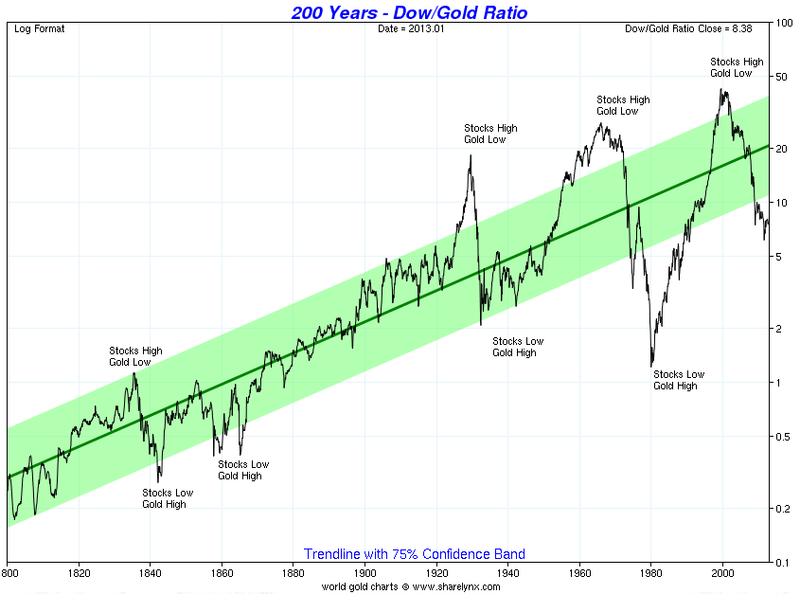 In the post-gold-standard world, a lower secular finale dow-gold ratio than 7 might be expected. 4. There has perhaps not been wide enough falls into secular cheap CAPE and p/e valuations, not enough country indices outside of Europe. Ditto the Q-ratio valuation for the US market. 5. Although we did see rates and inflation up in 2011, bond yields outside of Europe were conversely ultra low, and inflation did not exceed the 2008 peak. There are a couple of ways we can judge the validity of this alternative scenario going forward. If sunspots suddenly make a sustained rally to a new high then we are likely still rising to a peak. Conversely, if stocks continue to outperform commodities and we don’t see a reversal in leadership then we are more likely in a new secular stocks bull, which would be confirmed if commodities top out at a lower high. Kent raised a version of this scenario 12 months ago, and Barry Bannister clearly has also considered it. It is frustrating that 12 months later both this scenario and my primary scenario (solar peak and secular commodities peak ahead) are both still in play, with no clear winner, but therefore important to stay cautious. For my positioning – which is long equities but significantly longer commodities – it makes me a little nervous about the latter. If the primary scenario turns out correct then that ample commodities exposure should produce bumper profits, but if the alternative scenario is correct, the key is to identify the top of the ‘echo bounce’ or lower high in commodities, and not get stuck with tumbling positions that are unlikely to recover for a long time. Would be interested in your input on this. If you have additional evidence for one scenario or the other, I’m all ears. Many thanks Highrev! It is a reminder that the alternative scenario would invalidate the Gann predictions, whereas the primary would confirm them. But the caveat is that I maintain that the Gann mirrors in time are in fact largely the patterns in time of solar cycling, or rather the right stuff but the wrong understanding, so I do wonder whether they are a separate validator. Good article. I am still sticking to the first theory but we will see. There is also another alternative to consider: the solar peak may come later than expected, much later. Here is why. While the solar cycle is not fully understood, scientists are gradually figuring it out. Now, solar cycle peaks are supposed to come about 4 year after a minimum, but I invite you to take a look at the stunted cycles that came in the early 1800s, the same stage of the 180 year cycle where we are now. SC5 was the first stunted cycle, like we have now. 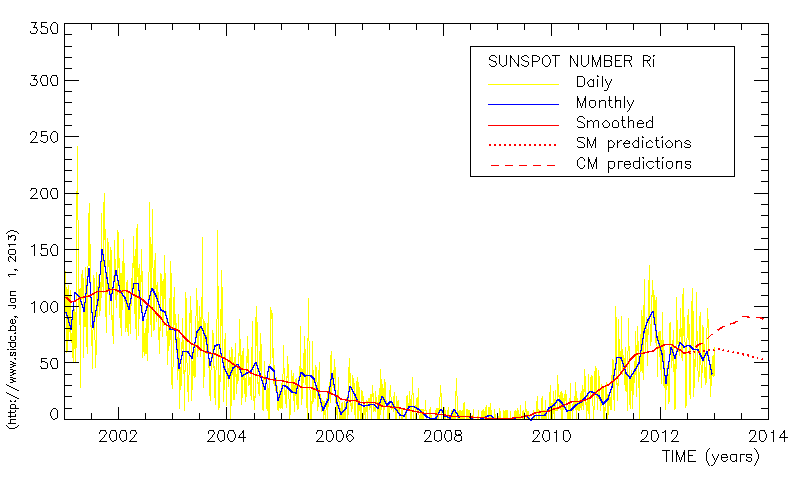 It started May 1798 and the smoothed sunspot number didn’t peak until February 1805, almost 7 years after its start. The next SC6 started Dec 1810 and peaked May 1816, more than 6 years after its start. And SC7 started May 1823 and peaked in Nov 1829, again after more than 6 years. Note that SC4 and SC8, peaked the normal 4 years after they started. So, what we see is that these 3 stunted cycles peaked two years later than normal. Or did they just err in their observations? If the current cycle resembles stunted cycles SC5-SC7, then it would not peak before 2015. I have not read the links you refer to much. But given the currency wars and QE and austerity fights to draw the duration of fixing deficits, budgets, etc. It might correlate to a stretched out cycle. The fund part is we’re all paying attention now, so it will be fun to watch this play out. Thanks for the info, the timing is important in my work. There is a congregation around May-Oct 2013, and as NASA’s forecasting technique differs significantly from SIBET’s, for example, then we can have more confidence. Essentially I defer to the pros, and whilst they are not all in sync, I suggest their general consensus makes the peak ahead in May-Oct 2013 the higher probability trade whilst a peak 2 years ago or 2 years away would be lower probability. I cam across your website and postings this month. You do an excellent job on the long term cycles and view. I myself use the J.M. Hurst method and have had a stab at the long term cycles for the USD and precious metals. Your cautious view on commodities is warranted and right now it could go either way. Short term I see an important peak for gold/silver in March or April and that could be a major exit point. For your reference are links to some of my long view analyses. I think a major bear is still due to begin later into 2013 with a major bottom in Q3 2014. So the secular stock bull is unlikely to start before then IMO. But I am looking for the same transition in various asset classes as you are. Please keep up the good work! Hi John, and thanks. Was unaware of the Hurst method – looks interesting and I have made a note to digest properly when I get some time post travels. Interesting to hear your calls. Is that your site or do you just publish your analysis there? hi John, David Hickson, the founder of Sentient Trader runs the site. He has invited me to post my Hurst analyses there. I have been doing the Hurst method for a number of years and post on various public and private forums. John, you deserve an applause for your willingness to re-examine your trading anchor rather than just being steadfast/stubborn on your belief.. The work of those excellent market technicians like Ralph Acampora suggests we are in a new bull market. I think the sub PE 10 events are compelling basis to the bull market assertion. Nothing too compelling, but interesting to read his case. I found a comment on a website recently, where somebody said about the rise in equities since 2009. They said “this has been the least respected bull run since I don’t know. Climbing a perpetual wall of worry”. This seems to ring true. People have been bashing equities more and more since 2000, but despite various negative shocks, markets have maintained upward trends. The cause behind the 1970s bear in stocks was predominantly the constant rise in interest rates, which kept denting consumer demand. Since 2000, interest rates have trended lower. My guess is the next major stocks correction would be caused by a rise in interest rates. The ECB rate rises of 2011 are the perfect example. They precipitated in a market crash and economic slowdown in the Euro Area, in the year following rate rises. Now that rates have been lowered, European equities have moved higher. Europe may begin to recover economically by 2015, and equities may continue upward trajectories if rates remain low. As the last cyclical bull in this secular bear (even if it transtioned in 2011) I believe it should be the least respected – reflecting the washout in sentiment to the opposite extreme following the peak hysteria into 2000. Based on the Monthly candle chart I’ve felt since Q3 2011 that Gold peaked with a giant bearish engulfing and tweezer top that printed in August and September. Since that point gold has not come within sniffing distance of this mammoth bearish reversal signal. Love the blog, a happy New Year to you and your family. John, I personally am waiting with eager anticipation to your giving your unique analysis to The Delta Phenomenon, with its interpretation on today’s market. Not much to ask!! Maybe the answer is there! SocGen gave a rather withering analysis on the outlook for gold this morning. Thanks everyone for making this a constantly interesting site – have to stop checking it at 3.00am though. Maybe the answer is as simple as going with the Fed, thus everything will increase in value. 1. Our credit markets are still pricing in lower interest rates in the next 6 months. Typically, when commodities increase, interest rates rise in Australia.Still this holds well for the argument of a June topping process in equities and a handover to commodities in 2H13 – 1H14. 2. The AUD is still very strong due to a variety of factors. Historically the AUD has fallen sharply at the end of the commodities bull. However in the recent 12 month – 18 month sell off this has not occurred. This means that either commodities will retrace and accelerate in the next 12 months, or that the global currency fight is providing a new structural level for the AUD. 3. The iron ore price rally recently was significant and strong enough to look like a bullish retracement. On balance, there does appear to be arguments for both sides. But im leaning to the argument that when equities start the topping process, monies will move back in the late stage cyclicals being commodities for an accelerative rally. whether this is the echo, its hard to tell at this point. your research is sun and moon based but have you studied planets as well?? Jupiter and Uranus will be in their same respective cycle positions where they were in1929.Saturn will be somewhat(50degrees) behind its position that year.Uranus 84 yr cycle means this is the first time back since ’29. should be a fun year. Not sure about Uranus and Saturn and other planets as I didn’t find compelling reasoning or correlations why/how they could influence people/markets. But would happily read if you or anyone can point to a compelling reasoning and correlation piece. http://planetforecaster.blogspot.com/ would my only scource at present. I would make a layman’s assumption that a planet such as Uranus with an 84 yr cycle may not be as studied as a Mars or venus simply because of the time one cycle makes…basically once per generation. but from what I understand these far out planets have agreater impact to behavior because of there infrequency. $1900 for Gold, S&P end year where it started. Maybe old news for some of you. Many thanks wxguru. The lack of scientific consensus on climate cycles is frustrating. Interesting read. Very interesting post you put in today, John! Thanks! I sometimes keep an eye on what Nadeem Walayat writes over at his Market Oracle site. Lots of vitriol there, for better or worse, but sometimes also thoughtprovoking stuff. Nadeem is fun to read when one’s in the mood to bash the banking lords of this world, but the guy is very good with analysing the housingmarkets of the UK and US. His conclusion now is that housing turned upwards early 2012, and since banks and finance are so dependant and leveraged to the housingmarket, we will see the stockmarket rise (led by banks) as long as housing slowly struggle upwards (which in turn is dependant on continued lowering of unemploymentnumbers – real or imaginary). 10% up in banks for every % up in US house prices. Makes sense to me, especially in light of this ongoing meltup in bankingstocks. Here in Scandinavia the preferential bankingstocks are the ones rising the most, which to me indicates big money is taking position. The last 4 –5 years of nervousness seems to be over for the guys in suits (for now). Just another amateur observation to add to one of the cups on your solar-scales, John. Thanks again. Thanks Sigge, and agree, global house prices should rise going forward along with stocks (K-spring), we just might need a cyclical bear setback before the momentum. Excellent work and brilliant site John. My take: the probability that a secular bull in stocks has already started is low. (1) the Shiller PE of the S&P 500 is just too high. How can a secular bull start at PE of 22? (2) Since late 2009, starting first with China and Spain, progressively more and more global indices have topped out, with the majority making cycle highs in Feb 2011-May 2011. Exceptions are only the S&P 500, DAX and FTSE 100. I admit this has become a weaker argument lately with the recent breakouts of the latter two, but nevertheless, the facts remain. (3) Demographics argue for a secular PE low ahead, not behind us. 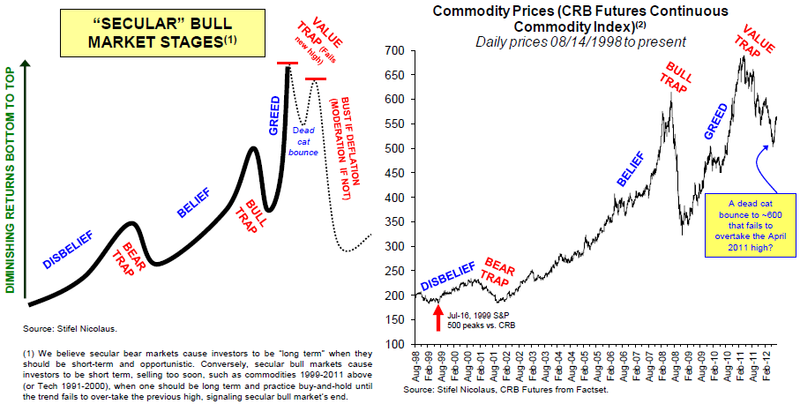 See http://www.financialsense.com/contributors/chris-puplava/2011/07/22/time-to-switch-from-a-secular-bear-to-bull-market-mentality. (4) Several market parameters argue for a large fall in equities ahead of us. John Hussman has done extensive research on the subject. His most recent work is at http://www.hussmanfunds.com/wmc/wmc130114.htm. Despite the article title, the demographics part still suggests new momentum only as of 2014/5 which would allow for a cyclical bear first. Certainly the overvaluation of the SP500 is unarguable – my wondering was whether it could be like the Nikkei of the last secular bear – remaining elevated, and leaving those waiting for it to return to secular cheapness waiting in vain. But I’m more inclined to think it will in fact cheapen in a last short cyclical bear. Thanks for your thoughts. I believe Chris’s theme is similar to Barry Bannister’s work, who was interviewed by Jim Puplava in May 2012 (can be found at the Financialsense.com site)..in the interview he called for SPX 1,400 at 2012 year end. It was right on. I have Barry Bannister’s (latest) 1st qtr. 2013 Market Strategy linked below. It is fascinating and a must read. As Barry Bannister says…13 years is long enough for the discount of the unknowns. I have on simple reflection to it all. Commodities i.e. Silver and Gold etc last peak was in euphoria with Hunt Brothers collapse. Are we there? Is there such euphoria or has it been? I think NO. Gold/oil will peak when people are really scared shitless. Hence I think the first scenario is more plausible even though you could argue as eloquently as possible for both sides. We need to see real GREED and FEAR. You are right, we have not seen that kind of mania. Gold should be the leading asset in this K-winter and it would be a historic anomaly if it had ended its secular bull in 2011 on that fairly measured move up. I don´t know, whether we see greed. But this I found in the beginning of 2012. I agree with Robert there has to be real fear for gold to peak & equities to fall; the collapse of the Euro could cause that fear but it is in protracted uncertainity at present and that is why I believe that John’s predictions are still to come but the timescales could be extended. I’d be thinking a short-lived US dollar collapse (a last one before a new dollar bull) and an inflation spike. But the US dollar daily sentiment is down to just 10 at the moment. It rather seems like the Euro needs to take a breather soon and the dollar regroup in the near term. slater9, I have allowed for another commodity peak to occur in 2013/2014 based on my USD Hurst cycle analysis. However, if you look closely at the long USD bear and how close we are to a major 36 year cycle bottom for the USD, you have to realize that an important turning point is due virtually at anytime for the USD. Cycles are not static, they are dynamic. When very long cycle bottoms approach they can contract or expand and trump the shorter cycles that I follow. I have to accept that it could go either way for commodities. My read on market action into the New Year is that any commodity rally we see will be fairly weak, and not very broad based. 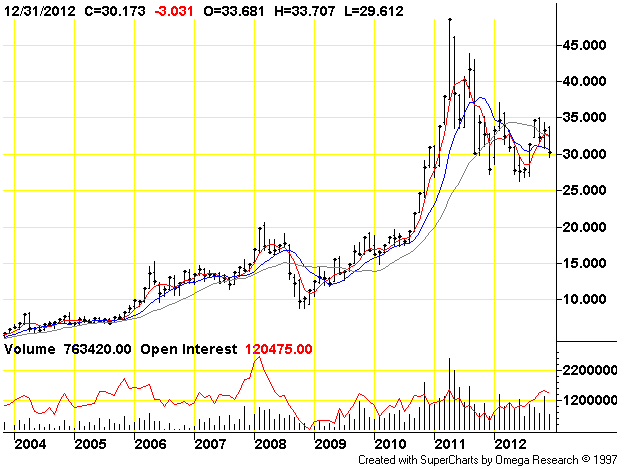 For example an important peak is due for gold/silver this spring/early summer. One that has to be sold IMO. Noted a recent article in Moneyweek (18 Jan) that analysis by Cheviot Value Management showed that since QE 1 there is a better than 90% correlation between the expansion of the Fed’s balance sheet and the price of gold. A forecast further expansion of 1 trillion in 2013 should, if the correlation persists, lead to a gold price around $2400. I live in SA and I never knew this site existed. Lombok, Kuala Lumpur, Penang + Phuket. and metals: copper, silver, platinum in (2011-4) then gold in (2011-9). With recent plunge of gold > silver + copper the odds have increased. above triangular down trend line. A bear trap = fake break out. You have listed multiple charts showing some ‘triangular breakouts’ on one of the posts. The fellow drew triangular trend lines erroneously by starting at the all time peaks. Triangles are a consolidation patterns to digest previous sharp move. They form the B wave of A-B-C move or wave 4 of 5 wave Elliott Wave Pattern. unanimously at the end of a long term trend. Ultimate contrary indicator. ‘Helicopter Bernanke will cause hyperinflation !’ Gold + Silver responded Nah ! Most folks overlook tsunami like power Deflationary Mass Mood. Look at Japan. their real estate makes dead cat bounces. 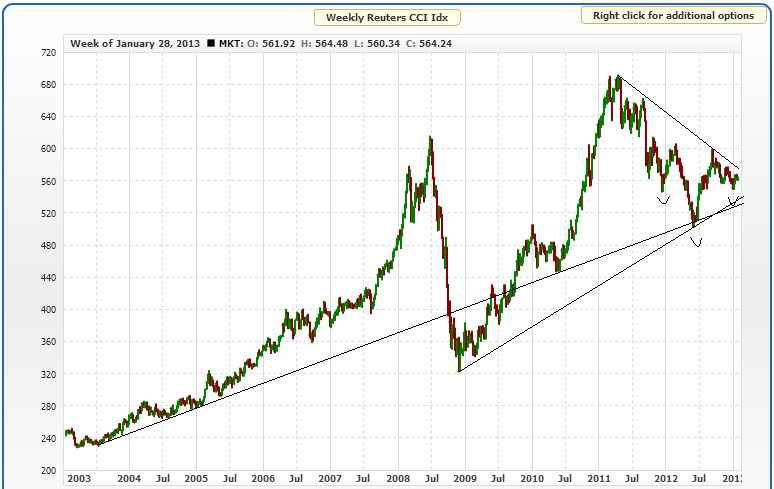 commodity peak expected this year to prevent it from making another all time high. How did you end up forecasting Real Estate bull ? as was seen in Tulip Bubble, South Sea Bubble, 1720-1750 Real Estate bust +. small cottages as part of downsizing forced by Deflation. of peoples + cultures Lord God has created out of Wisdom + Love.